Treat your feet! And we're not talking about an expensive pedicure or a relaxing foot massage but about these cute 50s Kirsten Socks in Burgundy! 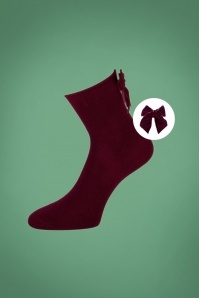 These ankle height socks are made of a luxurious, soft cotton blend in burgundy red with a navy blue heart across the instep and a wine red velvet bow at the back... cute! Every day is a gift, today's gift are socks!